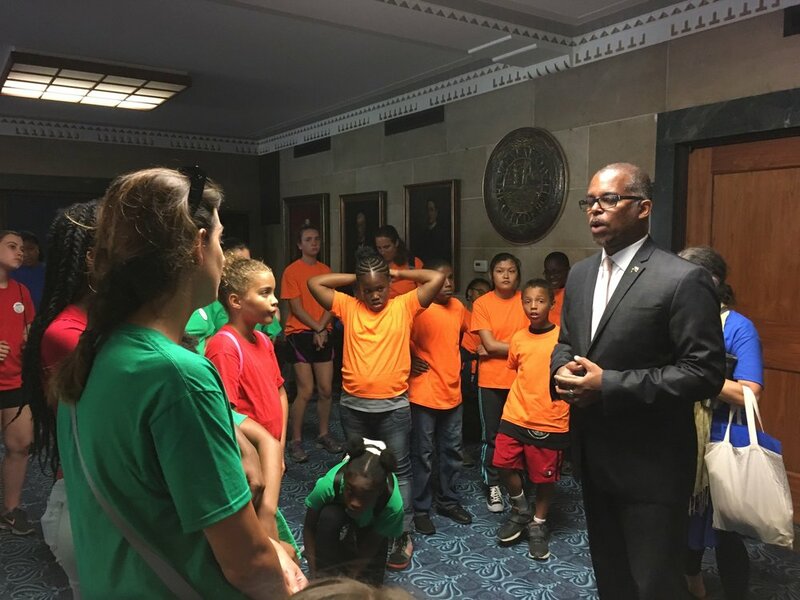 CAMP PEACEPRINTS is a summer camp designed to introduce youth to social justice, while providing them with peaceful conflict resolution skills and exposure to a broader community. It is a two-week long alternative education program for participants ages 8 – 13, with older youth serving as Youth Assistants, running Monday through Friday, 10am – 3pm. Participants take weekly fieldtrips and hear from local organizers daily. The lesson plans expose them to alternatives to violence exercises, historical movements to end oppression and modern day efforts in community organizing. Music, art, theater, dance, and recreation are significant facets of the program. 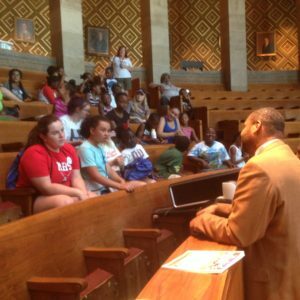 CAMP PEACEPRINTS 2019: "Discovering Diversity: An Intercultural Adventure"
Announcing the 12th annual Camp Peaceprints, brought to you by the Interfaith Peace Network, the SSJ Sister Karen Klimczak Center for Nonviolence, and the WNY Peace Center. 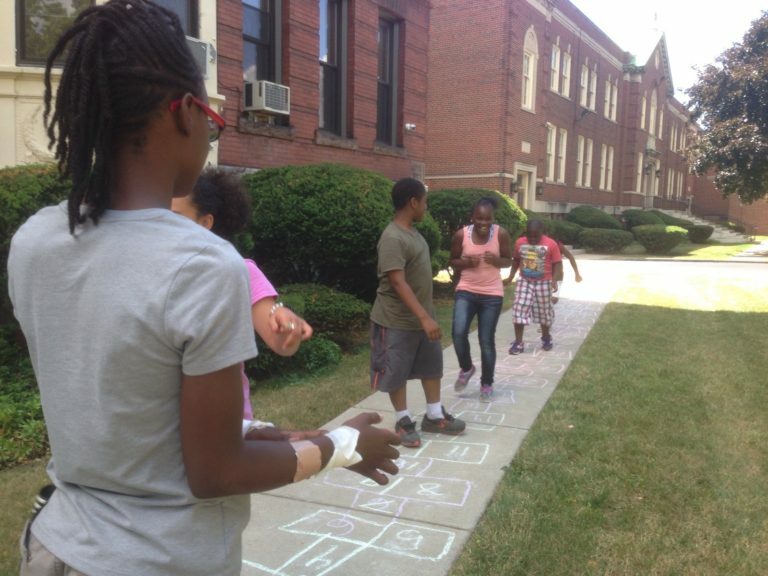 The Camp, for youth ages 8 to 13, provides exposure to a diverse community while introducing and exploring communication, social justice issues, community organizing, and peaceful conflict resolution. Our theme for Camp Peaceprints 2019 is “Discovering Diversity: An Intercultural Adventure.” Using the Kaleidoscope of Diversity to increase awareness of and comfortability with diverse people and cultures, Camp Peaceprints 2019 will start with our usual diverse camp community and explore different cultures. Of particular interest are the Deaf Community (continuing our mutually beneficial relationship with students at St. Mary’s School for the Deaf), the Yemeni community here in Western NY, and the Afghan community both here and in Afghanistan. We will learn about and hopefully interact with the Afghan Peace Volunteers via video conferencing. Our theme of diversity will extend to flora/plant and fauna/animal communities, stressing biodiversity as key to health and sustainability. We'll have wonderful guest presenters - activists and artists from the Buffalo area. We’ll also play games, have recreation (including swimming! ), do art projects, create music, and go on field trips. Registration is $125 per week, with sliding scale and scholarships available. 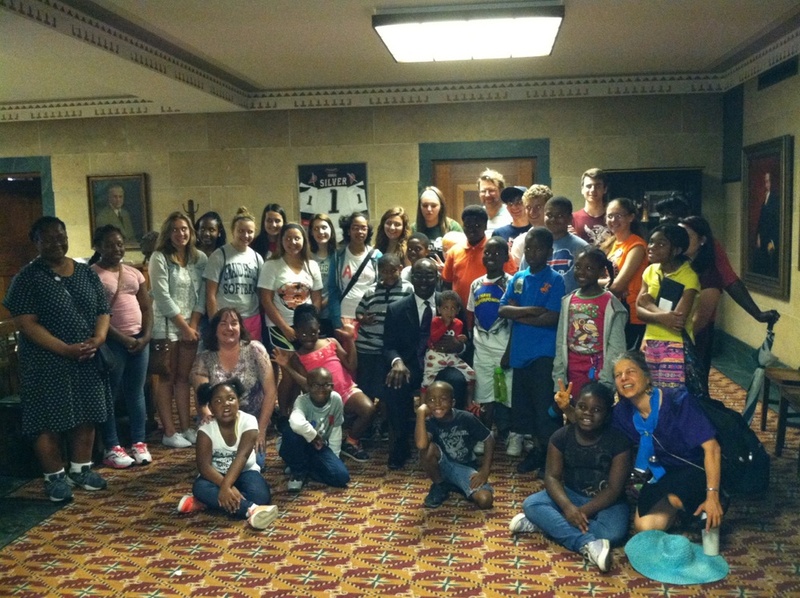 Youth assistants and adult volunteers are an integral part of the program. 2018 "The Language of Peace"
2013 "Telling Our Stories of Peace"
2012 "Peace With the Earth, Peace On the Earth"
2011 "Justice and Peace in Space and Time"
2010 "Think Globally, Act Locally"
2009 "Environmental and Social Justice"
2008 "Community Building and Social Change"
CAMP PEACEPRINTS 2018 "THE LANGUAGE OF PEACE"
Children and youth, all 56 of them – as well as adult volunteers – had an intensive experience of the Language of Peace over the two week period of Camp Peaceprints at St. Mary’s School for the Deaf in July. Sponsored by the Interfaith Peace Network, the SSJ Sister Karen Klimczak Center for Nonviolence, and the WNY Peace Center, our campers aged 8-13; youth assistants aged 14 and up; and adults (including parent volunteers, community helpers, interns, adult leaders of the Young Neighbors in Action groups, staff of St. Mary’s School for the Deaf and Foster Grandparents from the Catholic Charities program) – all learned about the Language of Peace through education, inspiration, and action. · Four sessions of instruction in American Sign Language. Instructors included both students and faculty of St. Mary’s School for the Deaf, as well as the Superintendent of the entire establishment, Timothy M. Kelly. We learned and connected to both the beautifully expressive language and the wonderful St. Mary’s community as never before! · Study of the peace quilts with symbols and images used by enslaved people and fugitives to communicate information about how to escape to freedom via the Underground Railroad, and creating our own quilt through an exceptional art project designed and facilitated by our faithful art director Janice Burns, MSEd, CPP, artist and art instructor. The project prepared us for our visit to the Niagara Falls Underground Railroad Heritage Center, an experiential museum that reveals authentic stories of freedom seekers and abolitionists in Niagara Falls. Their mission is to “inspire visitors to recognize modern injustices that stem from slavery and to take action toward an equitable society.” We were inspired! · Communing with nature through walking the paths of Tiffts Nature Preserve, lunching by Lake Erie, and experiencing one of the Seven Wonders of the World, Niagara Falls, up close on the Maid of the Mist, compliments of James and Mary Glynn, longtime supporters of the SSJ Sister Karen Center. 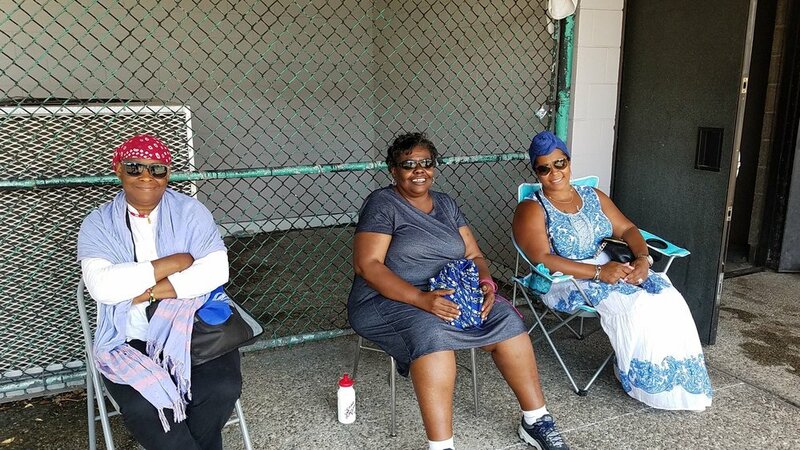 Even the camper whose mother said she would never ride on a boat did not want to miss out – she faced her fears and joined us, with the courage of community to back her up. Campers were inspired by all our experiences together as evidenced by their enthusiasm for Camp and for each other. Goodbyes were tearful, as usual, and buttressed by plans to keep in touch and return to camp next year. 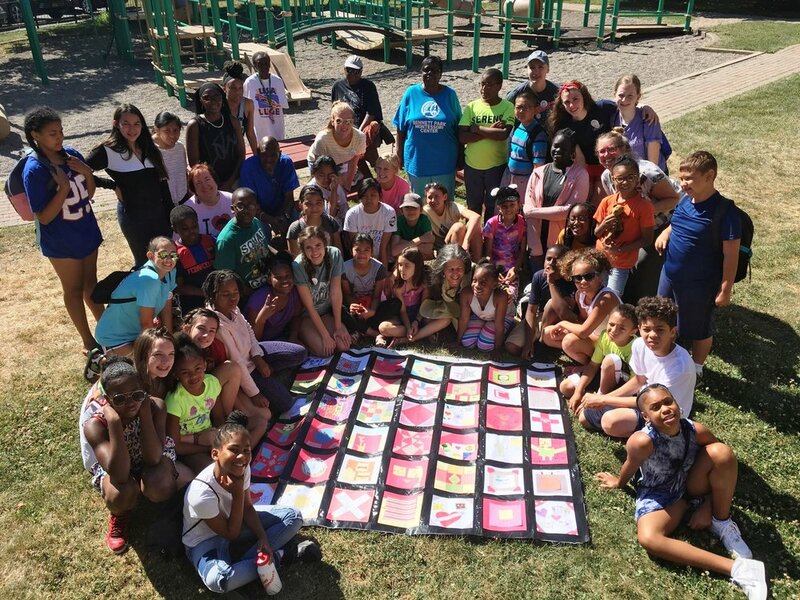 Expressions of the Language of Peace were being communicated throughout in tangible and heartfelt ways, as Camp Peaceprints once again created Beloved – and diverse – Community and a Culture of Peace. 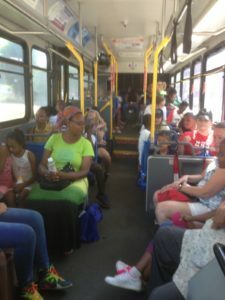 The Interfaith Peace Network, the SSJ Sister Karen Klimczak Center for Nonviolence, and the WNY Peace Center couldn’t be more grateful to Camp Peaceprints’ funders, supporters, transporters (including especially NFTA for both field trips! ), volunteers, participants, and well-wishers. The Camp Peaceprints community is sure to be practicing the Language of Peace in the future – may the expressions and actions create real change by speaking peace to our troubled world! CAMP PEACEPRINTS 2017 "Peace Networking"
"Peace Networking After 150 Years"
We had a wonderful tenth annual Camp Peaceprints, through the Interfaith Peace Network, the SSJ Sister Karen Klimczak Center for Nonviolence, and the WNY Peace Center. The Camp, for youth ages 8 to 13, was our best yet, with 58 youth altogether, including five under the 8-year camper age limit. As we build the Beloved Community, the needs of the community take precedence. Thus we allowed siblings and refugees with a real need to be included to come on in and be part of the Camp – we are Family! · I love camp … It is fun! You get to meet lots of other people. · On a scale of 1-10, I give it a 10. · Camp calms me down! Our Interfaith theme was well covered by speakers who shared key faith traditions and life ways. · Dr. Sucharita Paul, Hindu from Tonawanda and doctor at ECMC Emergency Room! · karima amin, Storyteller and Founder and Co-Chair of Prisoners Are People Too! · The Foster Grandparents program of Catholic Charities. 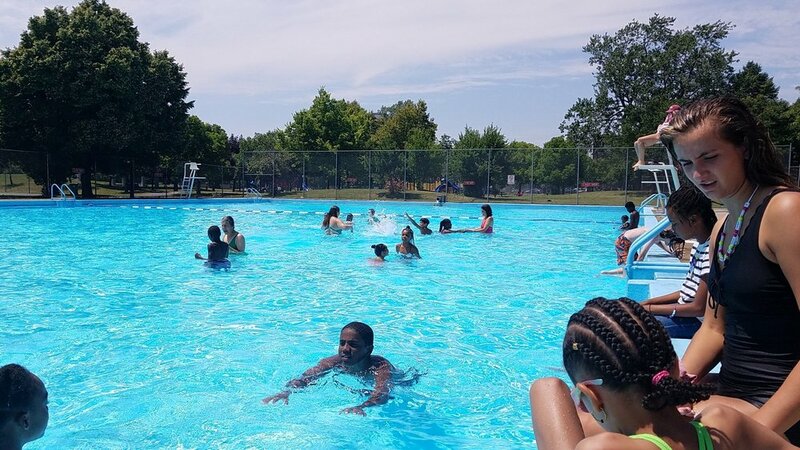 Through it all, it was fulfilling and fun, with swimming (5 times); field trips (to Grand Island’s Riverside-Salem UCC and Beaver Island State Park; as well as visiting – and sharing suggestions with – Mayor Brown; and exploring Tifft Nature Preserve); cooperative games; and peaceful conflict resolutions throughout. · You reading this – many of whom contributed through memberships at or donations to the Interfaith Peace Network, the SSJ Sr. Karen Klimczak Center for Nonviolence, and/or the WNY Peace Center. The camp got together – as we always have – with children and youth from St. Mary’s School for the Deaf, and we all learned some American Sign Language. It is always a high point of Camp – with immediate and strong connections made. So much so that this year, we resolved that we’ll explore full program integration next year. It’ll probably be our best camp yet! Again, many thanks to all for making it all possible!! CAMP PEACEPRINTS 2016 "Pathways to Peace"
The ninth annual Camp Peaceprints, put together by the Interfaith Peace Network, the SSJ Sister Karen Klimczak Center for Nonviolence, and the WNY Peace Center, was a rousing success. 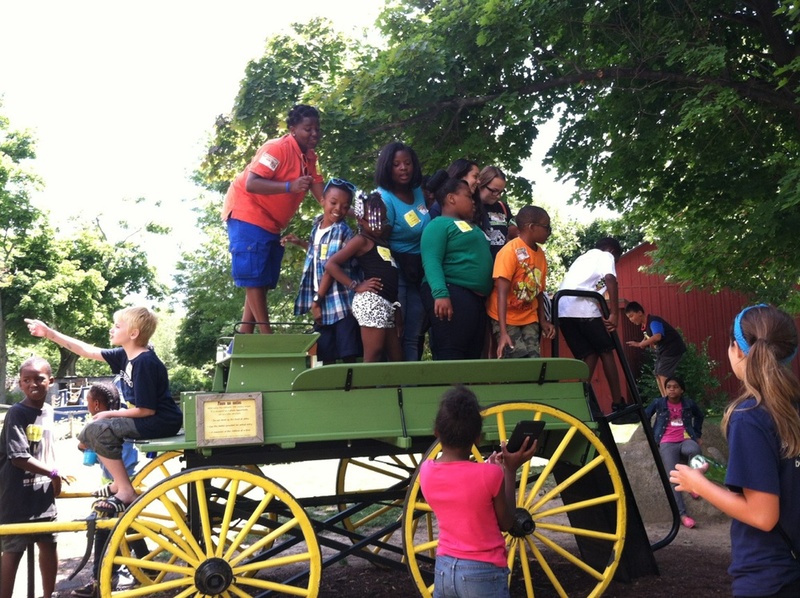 The Camp, for youth ages 8 to 13, provided exposure to a diverse community while introducing and exploring communication, social justice issues, and peaceful conflict resolution. Our focus on “Pathways to Peace” - or the various religionsand life-ways - was very well-received and fruitful. It was our best camp yet! Nurturing male role models were a particular strength of the camp this year. Our first group of Young Neighbors in Action (coming all the way from the Diocese of Sacramento, California!) were all young men, with two wonderful male advisors. 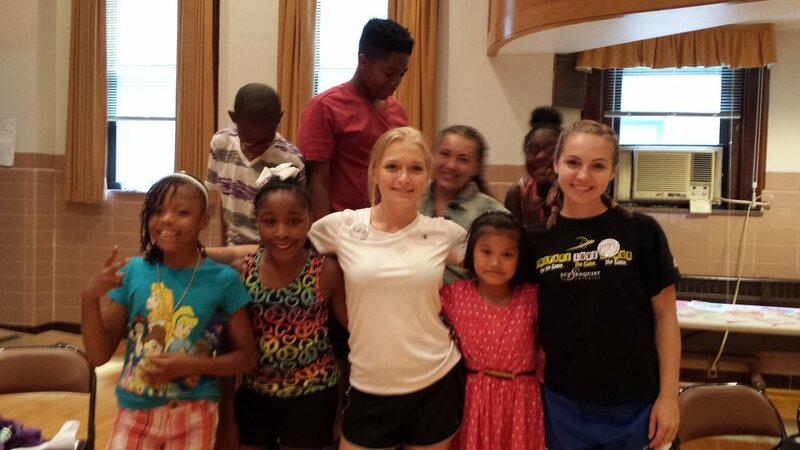 They were called upon to nurture the campers, and to be models of gentleness and peaceful conflict resolution. Their tremendous success in and great appreciation for such a role, in this fairly “macho” society, was exciting to campers and staff alike, and encouraged similar behavior, especially in the boy campers. Positive male role-modeling was further accentuated by the two volunteers who came as part of the Foster Grandparent Program of Catholic Charities. This year’s special focus on pathways to peace included learning about and celebrating different faith traditions and their common themes of peace, justice, sharing, and love. Indigenous life-ways, the Abrahamic faiths (Judaism, Christianity, and Islam) and Eastern faiths (Hinduism and Buddhism), were all covered by wonderful guest presenters - activists and artists from the Buffalo area. We began camp with a welcome and traditional thanks-giving from an Indigenous (Tuskaroran) woman, Jill Yagwaneest Clause. Our guest speakers also included a young Muslim film-maker and activist, an Episcopalian priest, a City Commissioner, an Imam, and a Buddhist monk- all peaceful, gentle, and accessible men. The strength of a compassionate nature was emphasized by all. Our art projects were once again led by Janice Burns, artist, art teacher, and director of the Motivational Counseling program of ECCPASA (Erie County Council for the Prevention of Alcohol and Substance Abuse). They included gift bags for homeless people that were left at the Homeless Jesus statue near St. Paul’s Episcopal Cathedral on our second week’s field trip. We also created artworks made of and left in nature at Tifft Nature Preserve on our first week’s field trip. A giant colorful Peace Dove was fashioned of puzzle pieces decorated with symbols and words representing what each camper had learned at Camp Peaceprints. Our field trip to a local mosque was covered by Channel 4 for working for interfaith appreciation and against Islamophobia. Back at the school, students from St. Mary’s taught us some American Sign Language. The intensity of affection, and determination to cross the language barrier to communicate, was powerful. We all learned to sign our first name and words for family members. St. Mary’s students also joined us in a drum circle. 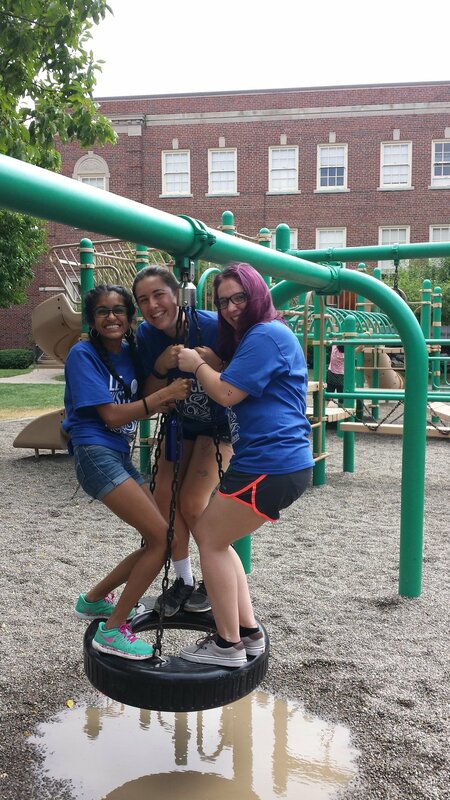 Our youth assistants from Young Neighbors in Action for the second week were young Catholic women from Milford, Massachusetts. They took over smoothly from our first group of young men from California, leading the campers in games and recreation, including swimming at Buffalo State College. Throughout the two weeks, adult volunteer Deidra EmEl was a calming presence and a big help with the camp program. Many thanks to the Network of Religious Communities, St. Mary’s School for the Deaf, the Center for Ministry Development and local coordinator Dennis Mahaney, WAVE (Women Against Violence Everywhere), St. Columba-Brigid RCC, the Presbytery of WNY, University Presbyterian Church, the Peace Education Fund, the Sisters of St. Joseph, and all others who gave of their resources to make Camp Peaceprints 2016 a life-changing experience for all! CAMP PEACEPRINTS 2015 "UNITY IN COMMUNITY"
Camp Peaceprints 2014 "Peace Messaging"
Camp Peaceprints 2013 "Telling Our Stories of Peace"